Don Cockroft, NFL's last double duty kicker. Every once in a while there are moments etched into the memories of every sports fan that they will never forget. The Cleveland Browns have had more than their share of these kinds of moments. Who could forget the drive, the fumble or even Red Right 88? The 1980 playoff game against the Raiders was a game that has been replayed and second guessed for over 20 years now. In many of the discussions, people point the finger at the kicking game that day as the big problem as to why they opted to pass the ball that was intercepted and subsequently lost the game for them. What was the real problem? What was said on the sideline? One person that can shed some light on the story is incidentally the person who unfortunately takes a lot of the blame and responsibility for the outcome. Don Cockroft, who now resides in the Canton area and serves as the Vice President of Alliance Petroleum Corporation can answer the questions as to what really happened on that frozen day in January. 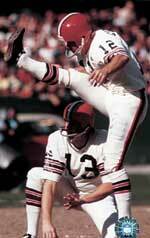 Cockroft was the NFL's last double duty kicker in the league and he served in that capacity for the Browns from 1967-80. The Raider game would end up being the final game of his 13-year career. The playoff game was one of the coldest games in NFL history. Wind chills dropped to a sub zero -32 degrees. Don was struggling through a number of aches and pains that had built through the season. "I was so stubborn that I would not let anybody take away my position. Nobody was going to take my job but me. When you think about it, I was the cause of my own downfall. I had the pain for most of the season. I could've gone on injured reserve in the middle of the season. They would have brought in another kicker and I could've rehabbed my knee." Don had missed an extra point and then on two different field goals. The Browns were down by a score of 14-12. This was a day where there would have been no sure kicks, even for a healthy kicker, considering the particular weather conditions. Time was ticking off of the clock. "As we moved the ball down close to the end zone, I remember that Brian Sipe was on the sideline. I normally did not say much to anybody but went out and did my job when the time came up. This time I went up to Sipe and said, "Brian, whatever you do, get it on the right hash mark." Coach Sam told Brian when he called the Red Right 88 play "If nobody is open throw that ball into Lake Erie." Sipe snapped the ball looked for the open man in the end zone. Once he saw Ozzie Newsome in the corner of the he let go of the ball and it sails right into the hands of the Raider Defense. 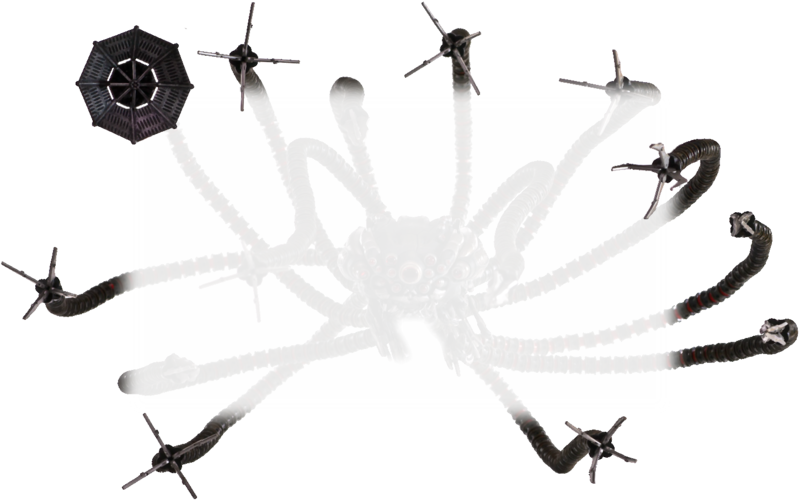 Interception! Raiders win the game. "It has been over 20 years later and people still come up to me and ask why we didn't kick the ball. Would I have made it? Who knows, but that was as close to the Superbowl that I had been my entire career." Don's 13-year career also rewarded him with a number of accolades with the Browns. 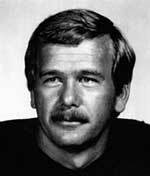 He was voted all pro in punting in 1972. He played in 188 consecutive games and retired as the 8th all time leading scorer in the NFL by scoring 1080 total points for the Browns. His longest punt was 71 yards and his longest field goal was kicked a distance of 54 yards. Cockroft also spoke of one of the most memorable games in his career. The 1972 regular season game between the Pittsburgh Steelers and the Cleveland Browns at Cleveland Stadium was important for the obvious reasons but the Lord took that game to teach Don a lesson that he will never forget. It was the tenth week of the season and the Pittsburgh Steelers came to town. It was a rainy muddy nasty day for a football game. The Browns were down by one game in the standings. The Browns needed to win the game to tie the Steelers with only four games left to the season. The Browns had a 20-0 lead at halftime. The Steelers fought their way back into the game in the second half and with 5 minutes to go in the game the Steelers took the lead 24-23. "I knew what was going to happen and I was ready." Said Cockroft. "The Browns took the kickoff and marched down the field. With 2:05 left in the game, I had the job of kicking a routine 27 yard chip shot and I go out to win this ballgame." I prayed like I never did before. I was lining up for one of the most important kicks of my career and at the same time trying to relax." "I remember Mike Phipps asking "are we ready?" I said yes." The ball was snapped and set for the kick. Cockroft followed through the ball and Kicked. "As soon as I kicked the ball I knew that it would have to take a miracle for it to go through the uprights. It didn't feel right too me. I looked up to see where it was going and it missed by only one or two inches to the right of the goalposts. Cockroft himself was looking to God for answers. "I said, "God how could you let me down? How could you bring me so far in the most important kick of my entire life and I fail?" I tried to rationalize what might have been but then it dawned on me that God didn't miss the kick, I did. When I went to kick the ball I disobeyed that most important rule. Instead of keeping my eye on the ball, I peeked up to see it go through, like the 83,000 people, and I missed it." "That was the second time in my career that I wished that I could quit this silly game and crawl away." Don walked off the field to the Browns sideline and one of his non Christian teammates was there to greet him with a barrage if insults and curses that would make the devil himself cringe. Another teammate walked over to Cockroft by the name of Billy Andrews. This man was a linebacker and more importantly a Christian and said "Don get your chin up. We are going to get the ball back and were going to give you a second chance." Don replied "Billy, get real, there is no way." He had lost faith in his self and his abilities. Another man walked up to Don and said the very same thing, "Don we're going to give you a second chance." It was about that time that I looked out at the field and noticed that it was third down for the Steelers. After an incomplete pass, Pittsburgh had to punt. The Browns had Leroy Kelly back and ready to field the punt. That's when Don started to pray again, "Lord, I'll keep my head down. I don't care how far I have to kick. Just give me a second chance." I really prayed that exact prayer." Leroy caught the ball and ran it back to around the 50-yard line. With less than a minute left in the game, Mike Phipps completed two unbelievable sliding and slipping passes to Frank Pitts. With 13 seconds left on the clock, Cockroft received his second chance. He walked out to the ball on the field only to notice that it was not more that a foot away from the spot where it laid just two minutes earlier. This time there was no comprising with the rules. The ball was set. Don kept his head down. He stepped straight and kicked through the ball. This time there was no mistaking the solid kick. "I said to myself after the kick, "It's got to be good." When I looked up heaven was there because that ball was going right through the middle of the uprights. The Browns won the game 26-24. It was the greatest thrill that I have ever had in football. Proverbs 3: 5-6 says, "Trust in the Lord with all of your heart and lean not on to your own understanding. But in all of your ways acknowledge God and he will direct your path." Don and his family moved back to north East Ohio one and a half years ago and currently reside in the Canton Area. Don also dedicates his time to the Canton - Akron chapter of the Fellowship of Christian Athletes. "God gave me a second chance in my life to really know what it was to follow after him. He gave me a second chance in the most important game in my life." Don continued, "As Christians we all fail. Thank goodness for God's grace and forgiveness. Really get to know God and trust the Lord and follow his way in peace and holiness. People will see God in you."